The Spear was a favorite weapon of the Arabs, especially for cavalry. Arab spears were usually made longer then the conventional spear seen in Europe and Africa, giving the rider more power and longer distance. Arabian cavalry was the foundation of many armies and Arabs pride themselves on their horses. Oman in particular is famed for some of the best Arabian horses, giving their cavalry an edge. These lancers are armed with the best of the Imam’s armor, linked mail, heavy jerkins and Indian shields. They are a quick and powerful heavy cavalry with much capability. 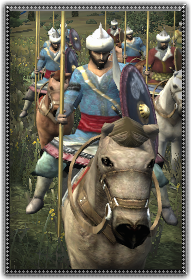 Well armed and armored, they are the pinnacle of Arabian Horsemanship and warfare, skilled at the Arab’s most trusted weapons: The Lance and Sword.